This first question focuses on the context of the film. It is designed to provoke discussion regarding the benefits and failings of modernisation, and how this concept manifests itself throughout the film. The film presents industrialisation as a grim, dehumanising force. Chaplin himself argued against the use of sound in film, because he felt it detracted from the physical wit of the performer, and the naturalism of the camera. The question is supposed to challenge our perception of technology, which today is seen as a symbol of progress. Chaplin, however, depicts technology as suppressing of people’s individuality and creativity. The fact that only the machines of the film are allowed to speak indicates a direct correlation between Chaplin’s view on sound in film and industrial modernization. The question is also meant to look at how characters communicate in silent film; the use of physical comedy and “slapstick” humour; and what sorts of ideas the film presents. Modern Times was the last of the silent films. Is the film about the end of silent cinema and the shift to new Hollywood? Modern Times has been called one of Chaplin’s most political films. What evidence is there for this? What messages or arguments about society do you think the film tries to convey? This question is about the ideas or messages the film is trying to impart on the audience. It is meant to generate specific examples of political or social commentary. Examples could include the horrible working conditions; the dehumanisation of American labourers; the mechanization of society; the effects of the Great Depression; and the fight for worker’s rights (unionism). The question is also meant to focus on the film’s depiction 1930’s American society, for the lower/working class. It should generate discussion of how life was back then; the socio-economic gap between workers and bosses; and how people sought escape from the monotony of manual labour. The efficiency of industrialism meant that one worker was now doing the work of many, forcing unemployment, which leads to desperation and crime. The film, as well being a very funny, biting satire, also offers a great snapshot of the era. The discussion could also touch on the film’s depiction of communism, as it was responsible for putting Chaplin on the “Hollywood Blacklist” as a possible communist sympathizer, leading eventually to his exile from America. Though Chaplin’s character is an unwitting leader in the communist march, the film depicts some pretty horrific working conditions at the factory. Chaplin could have been making an argument for workers rights, or he could have just been making an argument against industrialism. 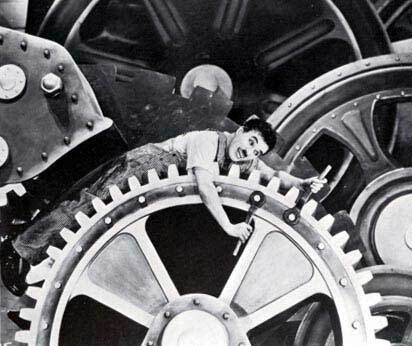 Perhaps the films most famous image is of Chaplin being fed through a series of spinning cogs and gears. What do you think this shot in the film symbolizes? What are some other images in the film that stuck out to you? The final question is about the imagery and symbolism presented throughout the film. The first part of the question deals with the famous image of Chaplin’s character being fed through a machine. This contrasts with the earlier scene of a machine attempting to feed the worker, designed to increase productivity. What is the relationship between these two images? Does it suggest a symbiotic relationship between man and machine, or the gradual mechanisation of people (twisting men into mechanical figures)? Different theories should be discussed. The question also asks about other striking or thematic images depicted throughout the film. Examples could include the workers exiting the trains like a herd of sheep; the hard, dark, frantic patterns of the factory and prison, juxtaposed against the soft, quiet, tones of nature; Chaplin’s waiter being pulled to and fro by the café crowd (an individual being swallowed by the tide of modernity). The question should generate different interpretations of these images, and how they relate to the film’s theme of modern life. One theory could be the dissolution of the individual. Everyone moves in uniform. The American worker, once a builder and craftsman, is now little more than gears in an assembly line.